Here is Southern Indiana there has been a chill in the air at night makes you think about fall. 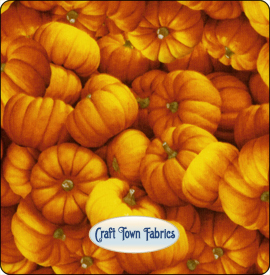 This pumkin fabric arrived Friday in time to make you fall projects, and who could resist these great apples? This entry was posted on Sunday, August 14th, 2011 at 1:00 am and is filed under Uncategorized. You can follow any responses to this entry through the RSS 2.0 feed. You can leave a response, or trackback from your own site.